In a short 9 day series I’m going to show you all the best bits about Cape Town and all the reasons why you should visit the beautiful city I live in! This undoubtedly has to be one of the most beautiful drives in Cape Town and is known as one of the most spectacular marine drives in the world. Chapman’s Peak Drive winds its way from Hout Bay to Noordhoek on the Atlantic Coast on the south-western tip of South Africa. The drive, affectionately know to Capetonians as “Chappies” is a feast for the eyes and showcases the majestic Cape Town scenery perfectly. Skirting 114 curves along its 9km route, the rocky coastline of Chapman’s Peak (593m) offers views of sheer drops to the sea below on one side and towering mountains rising above you on the other side. The twists and turns in the road seem endless and it is a photographers dream. The drive offers stunning 180° views and there are many viewpoints en route, which is ideal for photo opportunities, picnics and sun downers while taking in the exquisite scenery around you, but don’t forget to keep an eye out for our cheeky Cape baboons! During whale season, you might even be lucky enough to see the southern right whales in the ocean below. And if you are lucky enough to know a Capetonian like me, I know a secret spot below the road where you can climb down to watch the most beautiful sunsets away from the hustle and bustle of the road up above! 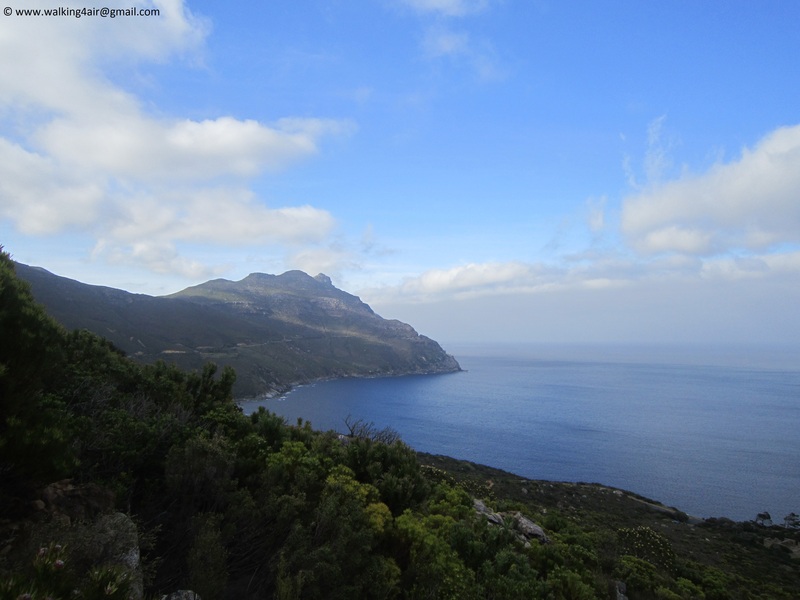 For the energetic, Chapman’s Peak Drive offers the most beautiful hiking experiences up the peak, through the Silvermine Nature Reserve and the Cape Peninsula National Park. 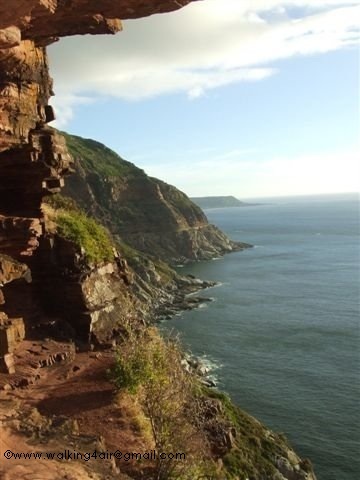 Chapman’s Peak is a 9km slice of paradise for motorist, sightseers, hikers, picnickers, runners and bikers alike ~ it simply is a must-see-for-yourself piece of heaven! If you live in Cape Town or have ever visited the Mother City in summer you will know about the South Easter wind that blows on most Cape Town summer days. Known as the “Cape Doctor” some days the wind can be relentless, gusting away and rattling everything in sight. It is a wind that many Capetonians have come to love to hate! I personally enjoy the wind, for without it we would have the hottest, most unbearable days and we would miss out on the perfect summer days after the wind has blown away the urban cobwebs of smoke and pollution, leaving only the beauty of Cape Town behind! Back in the summer of 1990, I was a young school girl in Standard 8 (Grade 10) and on this particular morning I got up and got ready for school like every other morning and headed out to the bus stop where I would catch a bus to town. Meeting up at the bus stop with my best friend, Emma Walker, we would board the double-decker bus and head to the back seat on the top, which we always claimed as ours! At a later stop another school friend of ours, Mandy, climbed on the bus too. There was nothing unusual about this day, the sky was blue, the sun was shining, and yes as usual the south easter wind was blowing. As we drove in the early morning traffic into the city centre where our school was, we chatted about all things teenage girls chat about. But as we pulled off the highway and turned into town things began to change. The wind howling around and smashing into the side bus had the bus driving precariously to the right. Nothing really unusual in that but as we chatted we stopped at the bus stop under the Civic Centre Building. People disembarked and the bus pulled forward. Suddenly mid-sentence it hit us all out of nowhere. The bus in front of us was began to lean at a dangerous angle to the right as it inched it’s way forward and as our bus drove behind it and left the shelter of the Civic Centre it hit us too. A few people screamed. Our bus literally flew to the right, leaning dangerously to the side. The bus in front of us was dangerously close to going all the way over. Without a moment’s hesitation Emma, Mandy and I grabbed our school bags and ran from the back of the bus to the stairs at the front and scrambled down the stairs. We wanted to get off. A few people got up to do the same. You could feel the panic in the air. Everyone knew what was happening and no one wanted to be there when it happened. 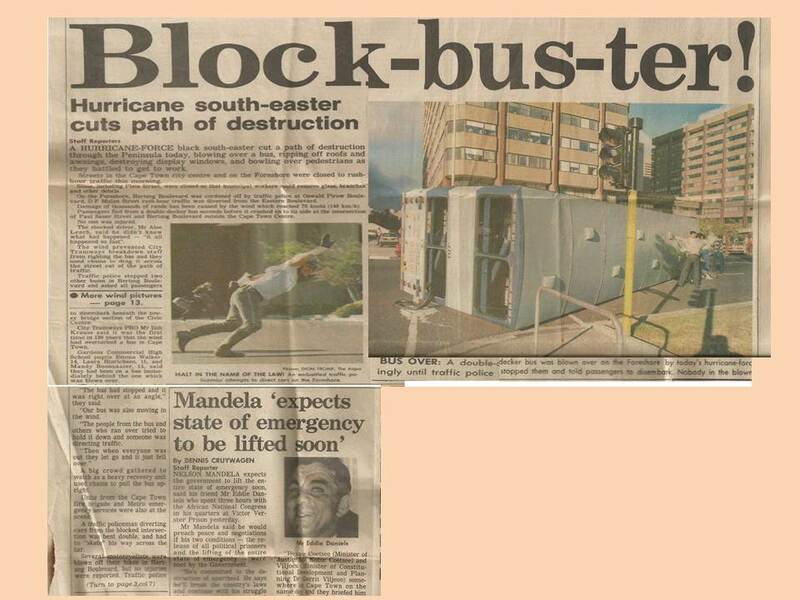 We had hit what has now become a notorious spot where the city’s high rises create a tunnel-effect when the wind is blowing and in that moment, a disaster was looming. What happened next was dream-like, pedestrians who could hardly stand up straight against the hurricane like-wind raced to the bus in front of us as our quick thinking bus driver started to reverse the double-decker bus we were on just as we reached the bottom of the bus. In everyone’s panic passengers were shouting at the bus driver to open the door, including us, to let us off. But within a matter of seconds, our bus driver had quickly and safely reversed the bus back under the shelter of the Civic Centre building and we all felt the bus stand up right again as the driver opened the doors for us, letting us all fall out in pure relief. As we stepped off the bus, the wind began to push us in every direction and we had to hold on to each other to stay up on our feet. A difficult task when you are trying to hold onto the school bag over your shoulder, while at the same time trying to hold your school dress down too! We would have been laughing at that point but something so much more serious was unfolding right in front of us. The double-decker bus that had been in front of us was still dangerously tilting to the right and the pedestrians who could hardly stand up straight themselves had rushed over to the bus and were literally doing whatever they could to hold the bus up while the passengers’ disembarked. Some were grabbing the windows, while others were holding onto the bottom of the bus or holding onto the section above the wheels. 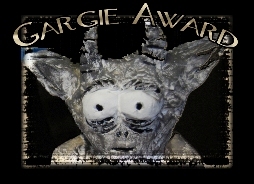 It was the scariest thing to watch and yet the most amazing! Strangers lined the bus, everyone was being battered, more people rushed in and grabbed hold as the wind pushed even harder against the bus as a stream of passengers’ jumped off. Next a huge gust of wind came and as we stood wrapped around the nearest pole, the bus slid out of the grasps of the men holding it and with a deafening crash the bus went over. Panic erupted as someone shouted someone was still on the bus. It was the most awful gut, wrenching feeling thinking someone was still on the bus. Thankfully, it turned out that the driver made it out in time as did all the passengers’ and everyone was safe. Everyone was talking to us and the shock of everything was beginning to take its toll. I don’t recall much of what happened after that besides the fact people were helping us stand upright and then some employees of one of the nearby buildings ushered us inside and gave us sugar-water to drink. All feeling a bit more stable on our feet we headed back outside in to the strong winds, grabbing onto whatever was nearby to keep us upright. Reporters from the newspaper had arrived and wanted to speak to us. As young teenagers this was all rather exciting, also not forgetting the fact we were the top talk at our school and we were going to be nice and late for class that day! It so happened that on that blustery day back in 1990, myself and two friends got our five minutes of fame. 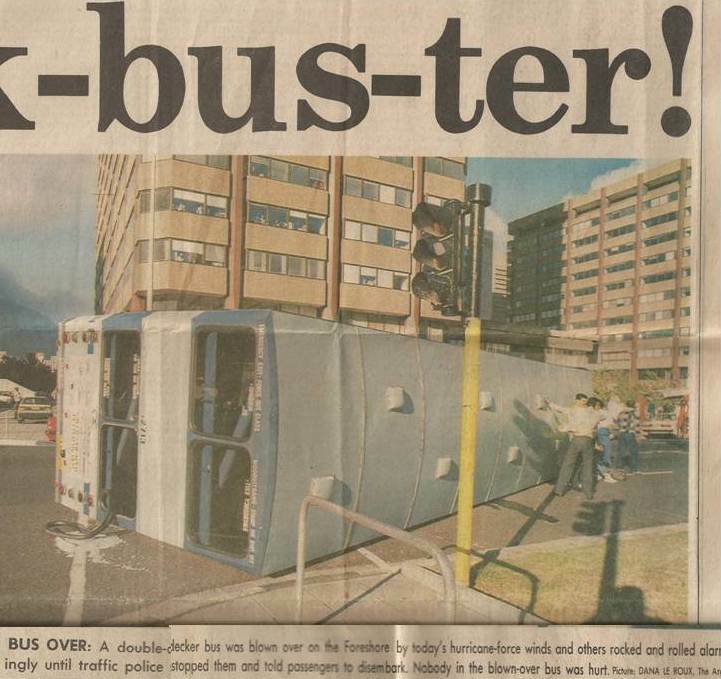 That night the story of the bus blowing over appeared on the front page (yes, read that again, the FRONT PAGE) of the Cape Argus. There in print, on the front page of the newspaper was our story and our names for all to read! Below are parts of the article divided up if anyone wants to read of our five minutes of fame! 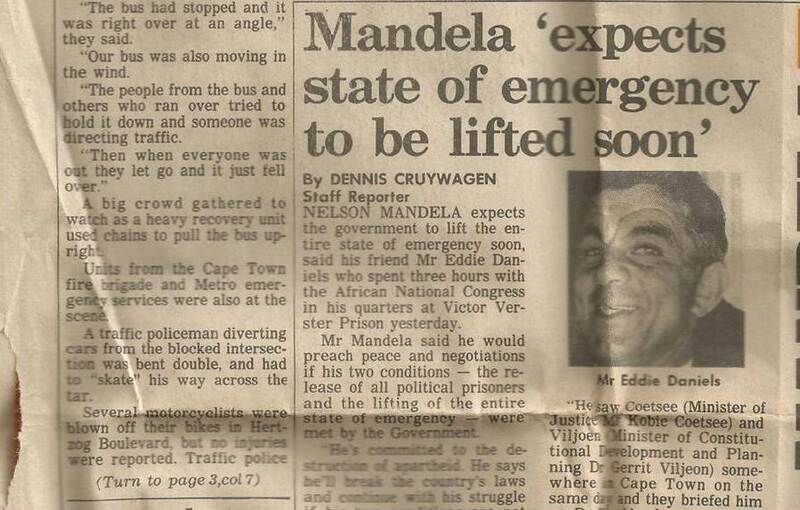 I have never forgotten that day and for the remainder of my school years in town whenever it was excessively windy we would retreat to the lower deck of the bus, not wanting to take a chance and to ensure we had a quick exit if it was needed. Here’s a great video clip of just how strong the wind gets in this area of Cape Town. The dramatic piano music works so well and as I watch the people in the wind I can’t help but laugh out aloud recalling the day the bus blew over (it’s great we can laugh about it now) and I laugh at all those other countless days I spent in town walking from the bus stop to school hanging on for dear life in the wind. In this video you too get to see the bridge of the Civic Centre Building that we drove out from (9 seconds into the video) when the wind hit the double-decker bus we were traveling in on that fateful day the bus blew over! I smile as I remember the shared laughs with my best friend and with strangers alike, the unexpected hand holding and the insaneness of it all. So many days as we clinged to our school skirts praying they would not blow up over our heads and hanging onto each other in fear we would both blow away ~ these memories make me laugh and smile. If you ever want a good laugh, take yourself to the Civic Centre on a really windy day in Cape Town and be prepared to laugh and to literally hang on for dear life. If anything, you will walk away from the experience feeling alive and rejuvenated, even though you will look like you have been dragged backwards through a bush! In fact, the experience of the wind in Cape Town could even be added to my list of reasons why you should visit the beautiful city I live in. So here’s to the Cape Town wind for the pile of amazing, crazy-funny memories I got to share with my best friend ~ as she is no longer with us in this world they are memories I will cherish forever!